Today is a great day for Majestic! We are (quite literally) going beyond the clouds as we aspire to be greater than the sum of our parts, by printing “The Internet” in 3D, in Space! Majestic is (Really!) going into Space. Today! 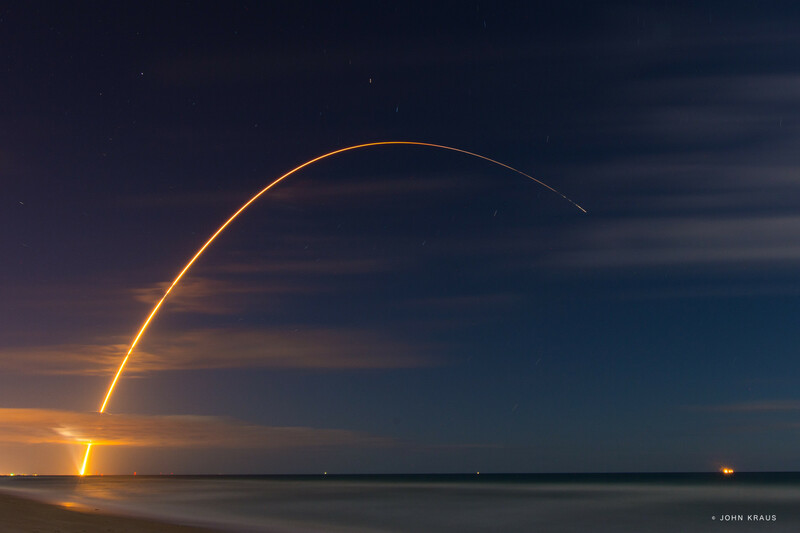 Orbital ATK’s Cygnus spacecraft was launched on a United Launch Alliance Atlas V rocket from Space Launch Complex 41 at Cape Canaveral Air Force Station (CCAFS) in Florida. On board is a 3D printer designed to work in zero gravity. Once the rocket reaches the International Space Station and everything is unloaded, a Majestic Landscape will be printed in 3D – representing a data visualization of the entire Internet. NASA say that the rocket is targeted to launch during a 30 minute window that opens at 11:00 PM EDT. 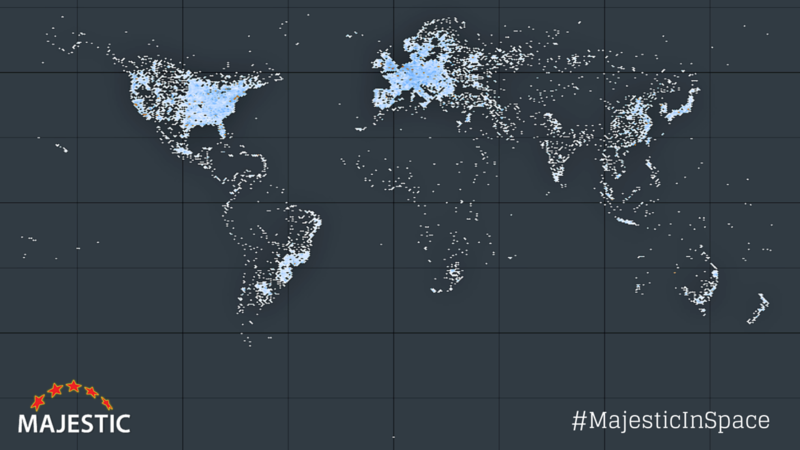 The #MajesticInSpace Project bridges two vast unknowns – the Internet and Space. Humans spend much of their time in one and thinking about the other. They are two worlds still largely waiting to be discovered, and #MajesticInSpace will help children and adults alike to understand some of the many complex crossovers between these two very different universes. What does the Internet Look like from Space? There are many ways to “visualize” the Internet. Here’s one that we created, a lat/long map of all the web servers on the planet. The observant among you will notice that we have not drawn any country lines on this map! It is JUST dots of servers. Fig 1. Internet Servers as Viewed from Space (Distribute with attribution under Creative Commons). But this is not the only way to visualize the Internet. The Internet has hundreds of millions of websites… like Galaxies, they gather in clusters. Galaxies are connected by gravity. Websites are connected by topics. Every website… and every page on every website… can be measured – based on the quality and quantity on those connections. This is what Majestic.com does, we’re a specialist search engine that measures the strength of those connections. If you map them all together, you can create a 3D visualisation of the entire Internet. What Does the Internet look like to a Search Engine? If everything goes according to plan up there on the International Space Station, this is what #MajesticInSpace will look like when the 3D Printer is all up and running. Fig 2: A practice run for 3D Printing of the Internet in space. Every business wants to put itself on the map. We decided to take ourselves off the map. The rocket will take time to get to the International Space Station and unload. We do not yet know exactly when printing will start, but over the next few months, Majestic will continue to provide insights into Space. You can track what’s happening here at our own Mission Control on the short link: Maj.to/go-space. If your kids have and school space projects and want something a little different, you’ll find plenty to keep you interested. We are also looking for examples of web content (particularly original and new web content) that connects Space and the Internet. If you have any great examples, drop them in the comments and we will link to the best. You may even win a 3D Majestic Landscape of your own website. Why are Majestic doing this? Majestic is believed to be the first British company to ever commercially manufacture something in space. Helping Space manufacturing is something Majestic are proud to support. The #MajesticInSpace project brings together two vast unknowns and in doing so, highlights how Majestic is on the frontier of the Internet revolution, not simply a participant or observer. There are more pages on the Internet than there are stars in the Milky Way. Being able to print in 3D in Space also has immediate practical applications – for example creating spare parts for the International Space Station. But who knows… one day we may just be mapping the terrain of far off worlds in 3D as well? If you would like to talk to Majestic to find out more about #MajesticInSpace, please contact us through any of our social channels. WHAT THE HELL!!! i want to go to space, that is amazing. This sounds like something i need to keep reading about, please keep posting about this as it is really interesting. Would it be okay to link to this post from <a href="http://www.coryseo.com/">Cory SEO</a>? That’s totally amazing. Congratulations Majestic team – no matter what else you do in life after this, being a part of a project with this scope will always be a great story! Rand – That’s REALLY kind. Mel has to take some credit. Plus Brendan Dawes the Data Artist that created the 3D program. Plus the guys that crawled the web… plus… well… at times like this I just realize that this cannot be done without a really great team! Appreciate the comment! Thanks Rand! It’s been and will continue to be quite the ride! OK, Dixon, this printing in space idea is, well, out of this world! Thanks! Here is a <a href="http://spacevids.tv/index.php/launch-cygnus-oa-6-atlas-rocket-cape-canaveral/">video of the launch</a>. Nice Image! Hope it isn’t falling back to earth too fast! 🙂 Thanks Alpesh. Fascinating accomplishment from a GREAT partner! Way to think outside of the box Majestic team. Keep up the great work! Bloody hell thats amazing! Well done to everyone involved to make it happen! State of Search have a video coming out in the next day or two after interviewing Mel and I as to what was involved and the "whole plan". It’s not just a case of thinking about it. Making it happen is hard and making it count was even harder. Very interesting stuff, perhaps someday in the future advanced 3D printers may serve as a Star-Trek like replicator technology to provide deep space missions with the ablitity to produce all the tools needed. Majestics data produces visual patterns that are nearly identical to that taken by sattelites from Space, thats fascinating. Congratulation Majestic Team! for an innovative task. > The observant among you will notice that we have not drawn any country lines on this >map! It is JUST dots of servers. I missed that the country lines are not drawn.When I first saw the diagram , I looked at America , India & West Europe and they pretty much retained their shape. just wondering what kinda printing & insights you would provide. We’ll be keeping things up to date over at blog.majestic.com/majestic-launches.